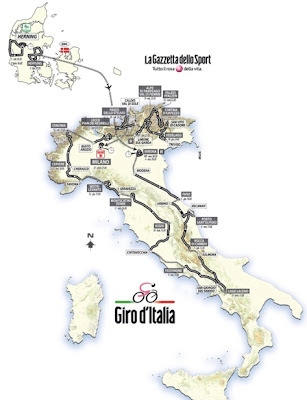 The route of the 2012 Giro d' Italia is official after today's presentation in Milan, Italy. It is claimed to be a more gentle route with fewer exhausting transfers, although upon closer inspection, they appear to be avoiding the long transfers by having the riders ride their bikes all over Italy instead. Not sure if that counts as less exhausting. The 2012 Giro will also be missing the 2011 winner Alberto Contador, and have a rest day after only Stage 3 and then not again until after Stage 15. At the presentation today were cyclists Alberto Contador, Mark Cavendish, Thor Hushovd, Matt Goss, Gilberto Simoni, Alexandre Vinokourov, Filippo Pozzato, Michele Scarponi, Nibali, Ivan Basso, and many more including, of course, Mario Cipollini! There is something about the Giro that requires one to watch and read in Italian - it's Italy! Can you remember who won the Giro in 2011?